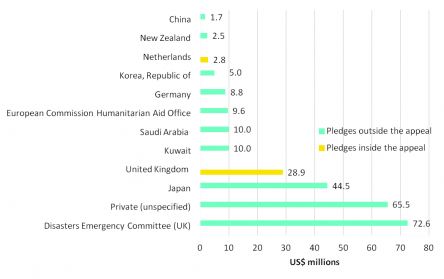 In the two weeks since Typhoon Haiyan hit, reporting shows that more than US$300 million of funding has been committed, while a further US$270 million has been pledged. Although the Philippines is no longer the lead story for international media outlets, the importance of transparency in the disaster response effort continues to be reiterated by commentators and experts, keen to ensure lessons learnt from previous disaster response efforts are taken into account in the response in the Philippines. 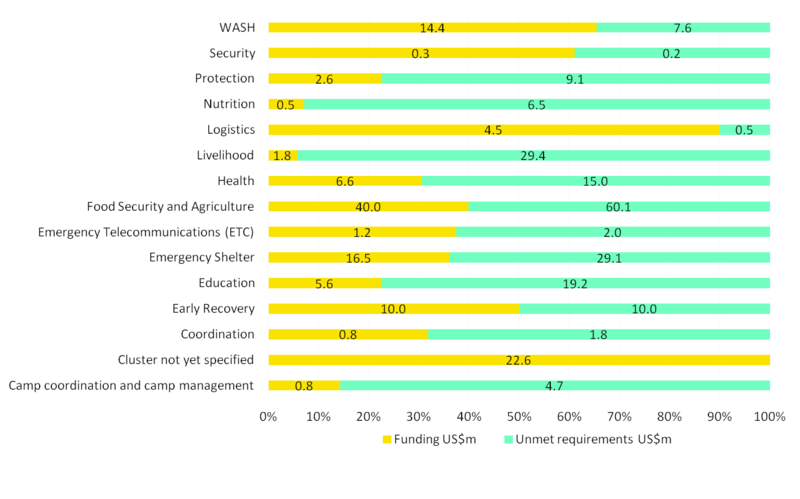 As the day by day funding comparison graph (Figure 7) highlights, current funding to the Philippines disaster (US$300 million) is less than one sixth of funding to Haiti at an equivalent point in time after the January 2010 earthquake (US$2.0 billion). 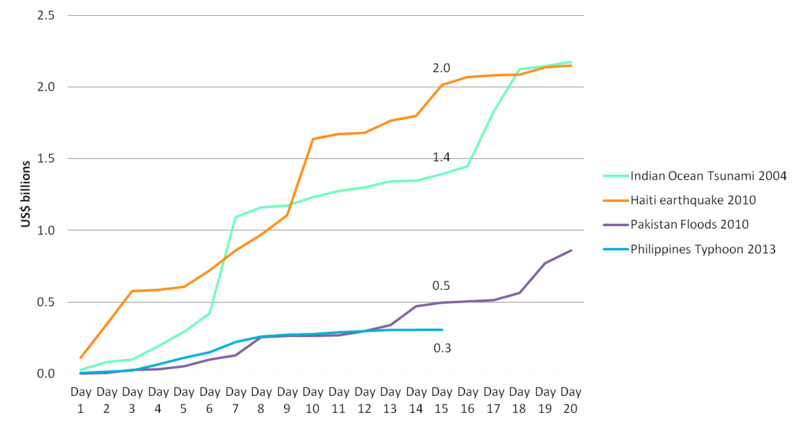 (More comment on the findings to be drawn from this graph can be found at my colleague Sophia’s blog on Charting Progress.) 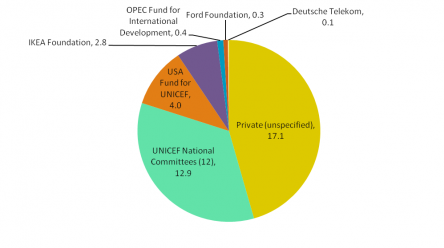 Therefore, perhaps this is an opportunity for humanitarian and aid agencies to guarantee the quality of the response, so that every dollar spent is accounted for and used effectively. This was also the message in the blog co-authored by Vijaya Ramachandran from the Centre for Global Development (CGD). 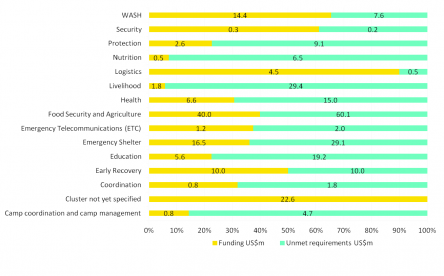 In her comment on the response to Typhoon Haiyan, she encouraged humanitarian and aid agencies to publish details of planned and actual spending activities to open data registries such as IATI, EDRIS and UN OCHA FTS. 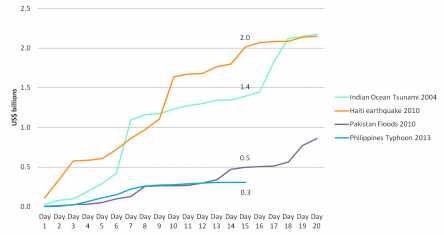 As regards actual funding data, two of the largest donors, the United Kingdom (UK) and the United States (US) accounted for the increase in funding recorded over the past 24 hours, with an additional US$14.5 million and US$10.3 million respectively. These two donors now account for 37% of overall funding so far, or US$113.7 million. Thailand, another Southeast Asian countryvulnerable to the impact of natural disaster events, became the latest donor with a commitment of US$200,000. 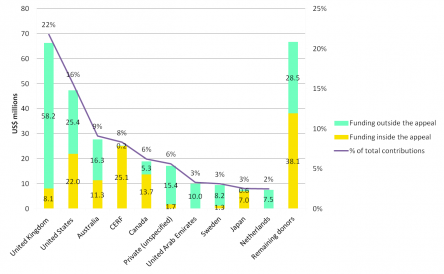 Uncommitted pledges have also risen to US$270 million which includes several new pledges from Australia (US$0.9 million) and the Netherlands (US$2.8 million). 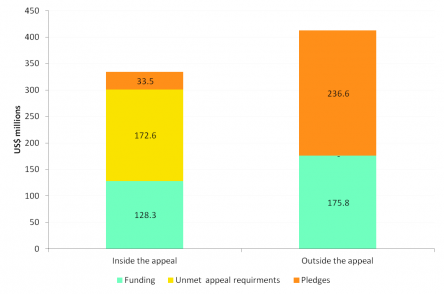 Interestingly, all of the Netherlands funding has been inside the appeal which is clearly seen from Figure 2 and Figure 3, whereas other countries have a mix of funding both within and outside the appeal. 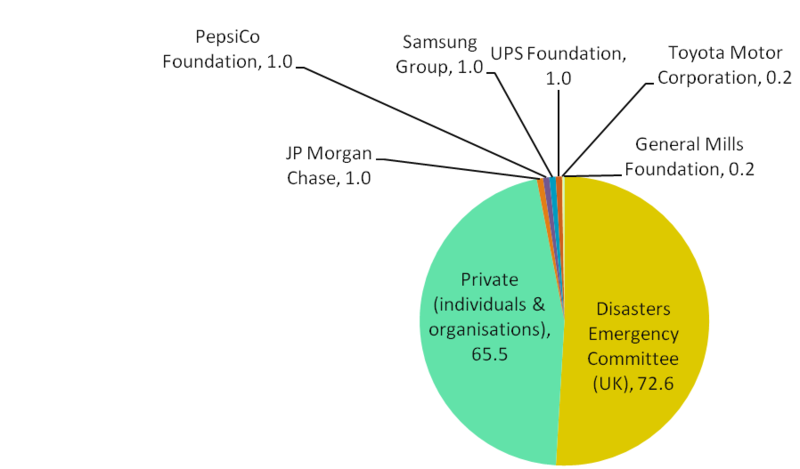 The final area to be highlighted is another increase in pledges from the Disasters Emergency Committee (DEC). 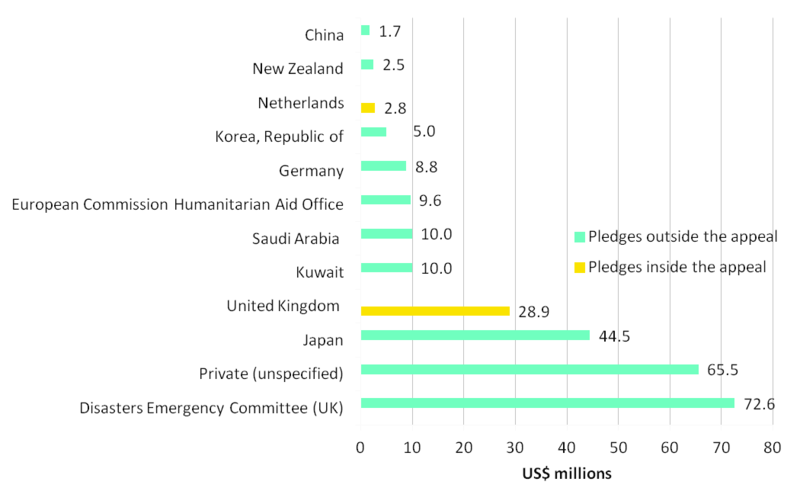 The comparative size of DEC pledges can be clearly seen from Figure 6, while the total amount pledged has now reached US$73 million. 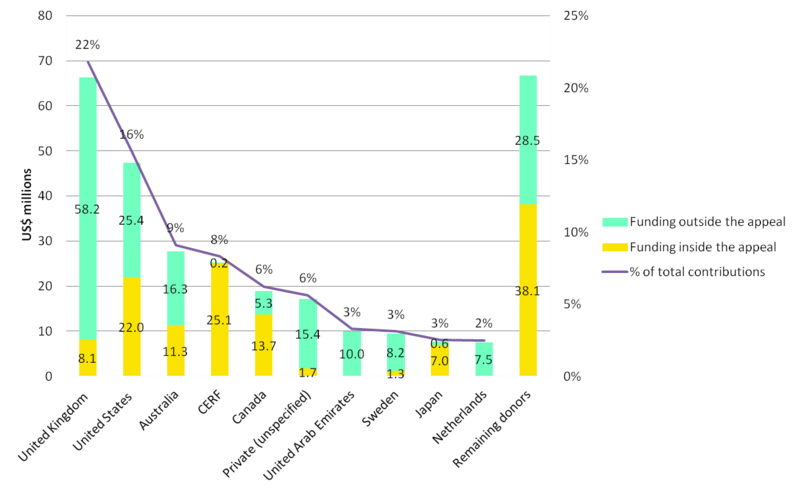 Notes: Uncommitted pledges are a non-binding announcement of an intended contribution or allocation by the donor.